For sale is a Gerber Baby Doll. Cute as can be baby needs a good scrubbing bath and fresh clean clothes. Size matters. Make sure to choose the one that is the best rate for your location. It's not the quickest but it will save you lots of money. 6" Gerber Birthday Baby Twin Dolls. Includes 2 dressed Gerber baby dolls, play suit with bonnet, birthday cake, invitation card, growth chart, and present. They are still in sealed plastic packets inside original box. The box has shelf wear. Please see photos for condition. The date on the back is 1979. Here is a LOT OF THREE GERBER BABY DOLLS IN BOXES. the white box has a sticker.Great deal here! Gerber 17” Baby Doll With Box And Accessories . The doll and accessories are still tied to inner box sleeve but box is in rough condition with some of the clear plastic window separating from box as well as some dents and scrapes on box. Shipped with USPS Priority Mail. Please feel free to ask questions. Thanks and good luck!! These Gerber Atlanta Novelty Moving Eye African American Twin 12” Baby Dolls share a basket lined with white eyelet trim pillow. The twins are vinyl with soft bodies and eyes that move side to side as the dolls heads are gently moved. They are wearing pink and floral sleepers. Comes with an additional floral dress and booties. Thank you for looking! I gave the doll a good surface wipe down, but it needs a real bath and clothing needs to be washed. Gerber Baby Doll 6" Girl Original Box. Condition is New. Shipped with USPS Priority Mail. Very nice 17' baby doll from the Gerber company. Manufactured in 1979, this item comes in a lightly used condition wearing a pink and white outfit. Please see photos and feel free to contact me with any questions. Has a few marks and stains but in overall good condition. In Cute blue onesie with bib and blue bow. Never removed from box. Gerber Baby Doll, 17". Flirty rolling eyes, Cloth/Vinyl. All Original 1970. He is marked, Gerber Productions c 1970 on back of neck. This version of the Gerber Baby Doll is a little more difficult to. This doll is new in box. The box says the baby cries ma-ma but not sure if that works. Not sure how to test it. Doll and stethoscope has never been removed from box. Paper storybook is not included. Box has shelf wear and from age. PLEASE READ THE FOLLOWING ~ Unless otherwise stated, my items are used. May show signs of gentle wear consistent with normal use. Please see all photos as they are part of my description. ~ 1. PayPal payment only 2. due within 2 days of auctions end 3. Please read all the details of my auctions. I try to list any flaws on items, but occasionally I miss things. If this happens please let me know! If you have any questions feel free to ask! I will gladly combine shipping. Vintage Black Gerber Baby, 1970's, with moveable eyes. 17" tall, with moveable eyes. Dressed in blue check and skirt. EXCELLENT condition. The item for sale is a Gerber Baby Doll wearing Christening outfit with basket and bedding in original box 1979. Doll is wearing beautiful white eyelet christening outfit with hat, shoes & socks. Made by Atlanta Novelty, a division of Gerber. VNTG 1989-15.5" Gerber Baby Doll w/ Sleeping Eyes, org. Packaging!! Exc. Cond! 1989 Gerber Baby with sleeping eyes. This baby is absolutely adorable! It comes in the original packaging which has been opened but this item is still in excellent condition!! VINTAGE 1979 GERBER BABY DOLL 17" MOVING BLUE EYES, ATLANTA NOVELTY CO. . Condition is New other. The box is stained with age. Please see photos. The dolls eyes move. Soft, safe & washable-easy to dress-no loose parts. For children 18 months & over. Very nice doll. Includes 11" Gerber Drink & wet doll, bib, baby bottle and 2 food boxes. We are not expert in all areas. Unless stated to the contrary. Here’s an adorable vintage 1989 Gerber baby doll. She has a cloth body and vinyl limbs and head. She has open and close blue eyes. She’s wearing an adorable christening gown. I’m not sure if it is original or not. She is in good played with condition. Please look at the photos carefully as they are part of the description. All sales are final. I do not cancel bids or auctions so please make sure you want the item before bidding or buying. Thank you for looking and good luck! This sweet doll is marked Gerber Products Co. 1970 on the back of her neck. Sizes are always approximate. I hope I never have to do this. This dolls condition is cons istent with her use and age. txzj pxzj7179 txzj-12. New Listing1946 & 1947 Gerber Baby Books, Gerber Products Co.
2—51/2” by 8 1/2” books in good condition. Condition is Used. 1995 Toy Biz Gerber Baby Doll. Very Good Condition. •With bottle. Vintage 1995 Gerber Fruit baby's SET of 4, Mint condition!! Excellent SET of 4 Gerber Fruit Baby's all are mint condition, never opened!! Rare find for the whole collection!! Perfect packaging! Doll: Baby Bananas. Gerber Fruit Baby Doll. Doll looks to be in good shape. New in Sealed Box. Condition is New. In cl ud es 2 complete ou tf it s an d accessories. Never opened. 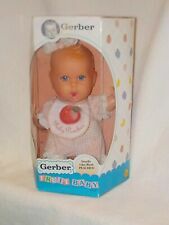 This is a lovely 1994, nice clean cloth and vinyl, Gerber Baby Doll. Her condition is excellent. I see no flaws nor detect any odors. Doll has a few markings on her head and face, light stain on back of body as seen in pics. Soft cloth body, vinyl head, arms and legs. She is about 20" long. 1979 Gerber Moving Eyes 17” African American Baby Doll by Atlanta Novelty The baby doll is vinyl with a soft body and is wearing a pink gingham and lace dress and white knit booties. The eyes move side to side as the doll’s head is gently moved. The box shows signs of wear due to age, as shown in pictures. Thank you for looking! No box available, small stain on pad as shown. Gerber Christening Baby doll 12" 1979 Atlanta Novelty. Condition is New. Shipped with USPS Priority Mail. Gerber Baby Doll. from Toy Biz. very slight wear from age and use. Manufactured by Atlanta Novelty. She is 10" tall with porcelain head, arms, and legs on a stuffed cloth body. She is #875 in a limited edition of pieces produced. however she is missing her red velvet bonnet. This is the Gerber Baby Doll 50th Anniversary Edition. She is 17” and in perfect condition. 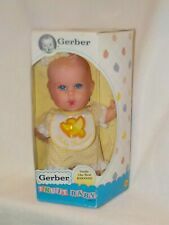 VNTG Gerber Collector doll By Toy Biz W/ Certificate, brand New, Never Opened!! Sealed in original packaging, Gerber Collector Doll with the certificate of Authenticity and a parent guide. I have 3 total of these dolls and All 3 items are in Excellent Condition!! STATIONARY EYES. TOY BIZ INC BABY DOLL. She has eyes that move from side to side, she does not appear to have ever been played with. All dolls are sold as is.